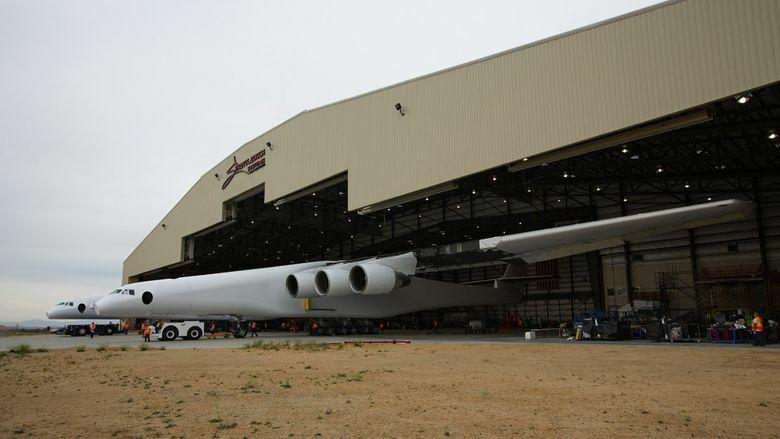 Paul Allen’s 250-ton Stratolaunch airplane finally rolled out of its hangar Wednesday in Mojave, Calif. It won’t launch a rocket into space any sooner than 2019, and Stratolaunch faces skepticism about its business plan for delivering satellites to orbit. 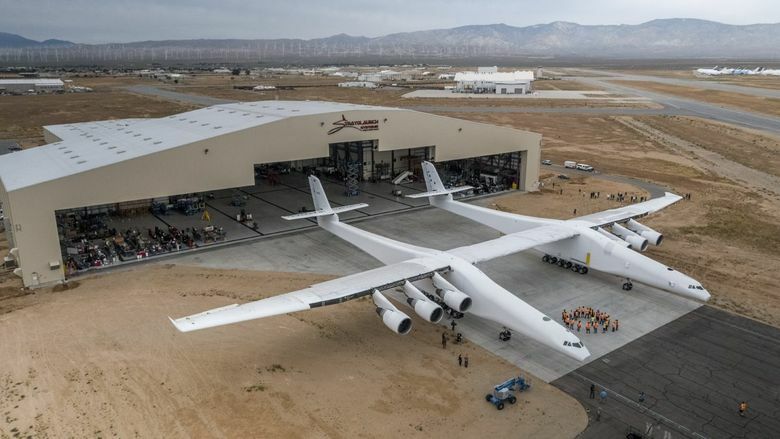 Paul Allen’s monstrous Stratolaunch airplane finally rolled out of its hangar in Mojave, Calif., Wednesday, showing off its complete twin-hulled majesty for the first time. It will now spend many months on ground tests before a first flight. And it’s not expected to be used to launch a rocket into space — a mission that some observers are skeptical will ever make business sense — any sooner than 2019. 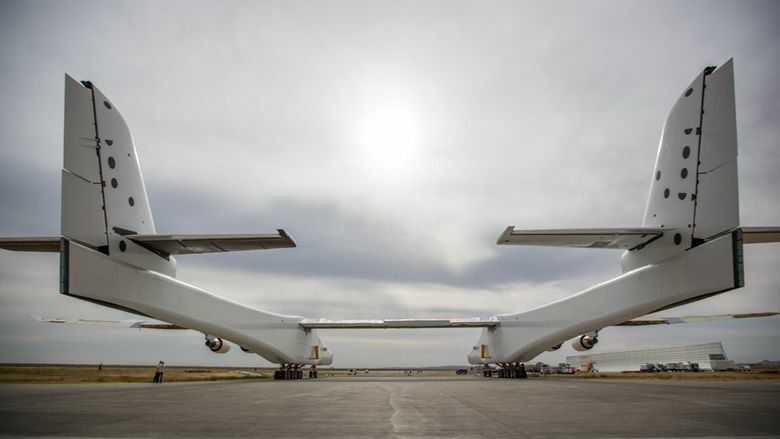 Two tugs pulled the 250-ton giant from the hangar where it was built for Allen’s Stratolaunch Systems company by Scaled Composites, the specialty airplane-development firm founded by aviation pioneer Burt Rutan. Over the past few weeks, mechanics removed the last of the three-story scaffolding that had surrounded the aircraft during construction, leaving the aircraft’s full weight to rest on its 28 wheels for the first time. 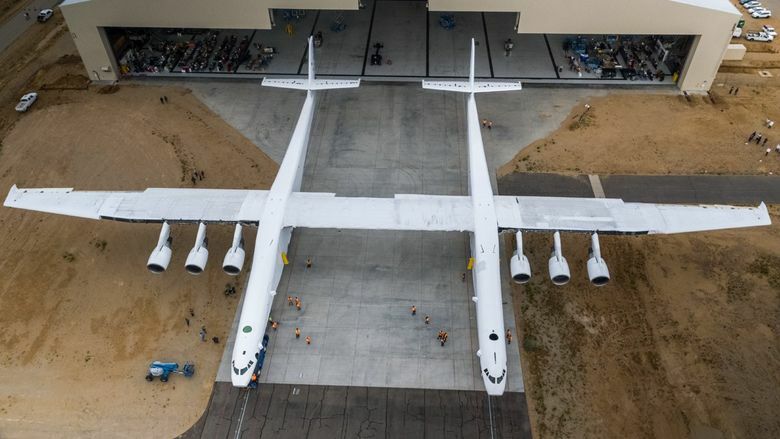 Jean Floyd, chief executive at Stratolaunch Systems, said in a statement that the empty airplane, powered by six used 747 engines, weighs approximately 500,000 pounds. 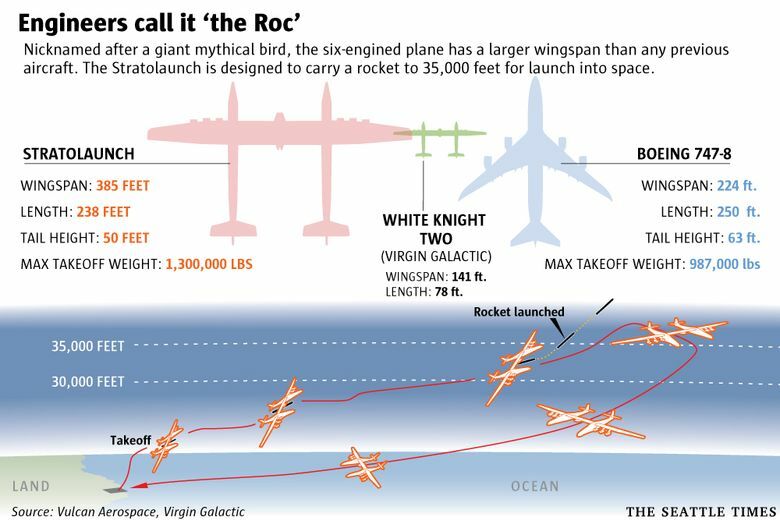 The plane — nicknamed the Roc, after a mythical Middle Eastern bird so big it could carry an elephant in its claws — will have a three-person crew: pilot, co-pilot and flight engineer. They’ll be in the flight deck of the starboard fuselage, maneuvering the plane from far to the right of its centerline, while the port fuselage cockpit is empty and unpressurized. Stratolaunch is intended to carry a rocket slung beneath the central part of the wing, between the two fuselages, and release it at 35,000 feet. The concept is that the rocket will then launch into space and deliver satellites into orbit. For comparison, the empty weight of the world’s largest airliner, the double-decker Airbus A380 designed to carry around 550 passengers, is 610,000 pounds. And the empty weight of Boeing’s largest jet, the 747-8, is a paltry 435,000 pounds. Paul Allen’s aircraft is 238 feet from nose to tail, and it stands 50 feet tall from the ground to the top of the vertical tail. It will carry about 250,000 pounds of fuel and a rocket payload of up to 550,000 pounds or 275 tons, giving it a maximum takeoff weight of 1.3 million pounds — equal to the fully loaded weight of the A380. 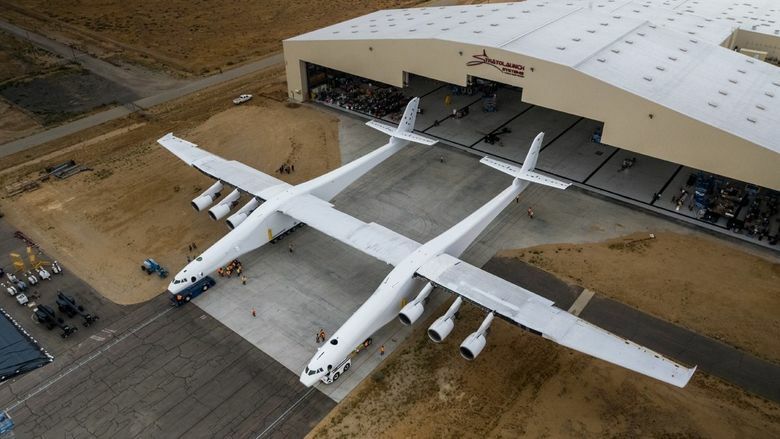 There’s plenty of skepticism about Stratolaunch’s business plan for delivering satellites to orbit using this behemoth plane. Since Allen first put forward the idea in 2011, both Elon Musk’s SpaceX and Jeff Bezos’s Blue Origin have successfully pioneered new reusable ground-launched rockets that are already dramatically lowering the cost of access to space. And the satellite business has changed, with demand shifting toward small satellites going to low Earth orbit, not the huge, minivan-sized satellites that used to be standard. The airplane may be simply too colossal and therefore too expensive to be used to launch smaller satellites. Progress on the project has been slow. A year ago, Stratolaunch’s leadership indicated that it hoped for a rollout by the end of 2016. Yet driven by Allen’s passion for space and science fiction and funded by the billionaire — courtesy of co-founding Microsoft more than 40 years ago — construction of the airframe is complete and the Roc has finally emerged to the light of day. Floyd on Wednesday laid out an extended time frame, though he didn’t specify when the aircraft might first take to the air. “Over the coming weeks and months” at the Mojave Air and Space Port, the aircraft will undergo “ground testing, engine runs, taxi tests and ultimately first flight,” Floyd said. “Stratolaunch is on track to perform its first launch demonstration as early as 2019,” he added.